From noble jewels to semi-precious gems, a show in May will celebrate a ‘golden period’ of Portuguese jewellery in the 18th century. Here we preview the exhibition and then present other recent and forthcoming sale highlights. Travelling in Portugal in the 1760s, Italian writer Giuseppe Baretti observed that the country “is very rich in gold and jewels. Their riches, however, are not the product of Portugal but of her ultramarine settlements”. 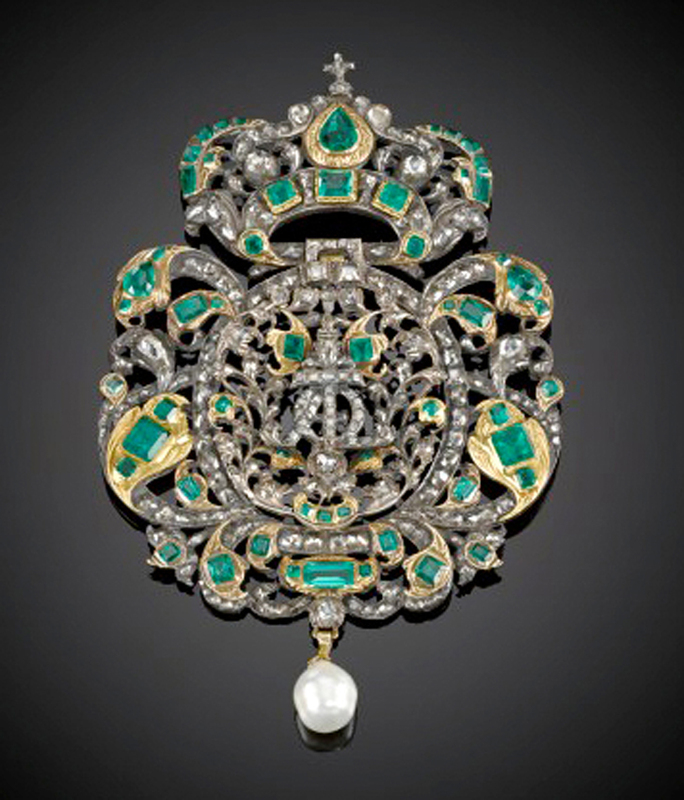 Portuguese jewellery from the 18th century speaks of empire. In particular, it tells of the discovery by the bandeirante, after two centuries of searching, of lucrative mineral deposits in the Brazilian interior: gold in the 1690s, diamonds in the 1720s and large quantities of tourmalines, aquamarines, topazes, chrysoberyls and amethysts after the 1730s. The riches of the so-called Minas-Novas (new mines) gave a huge stimulus to the ‘national’ jewellery trade in Portugal. Francis Norton, a director at London dealer SJ Phillips, says the Mayfair firm has been buying Portuguese jewellery from this golden period for about a decade in anticipation of a first selling show at the time of last year’s Frieze Masters. 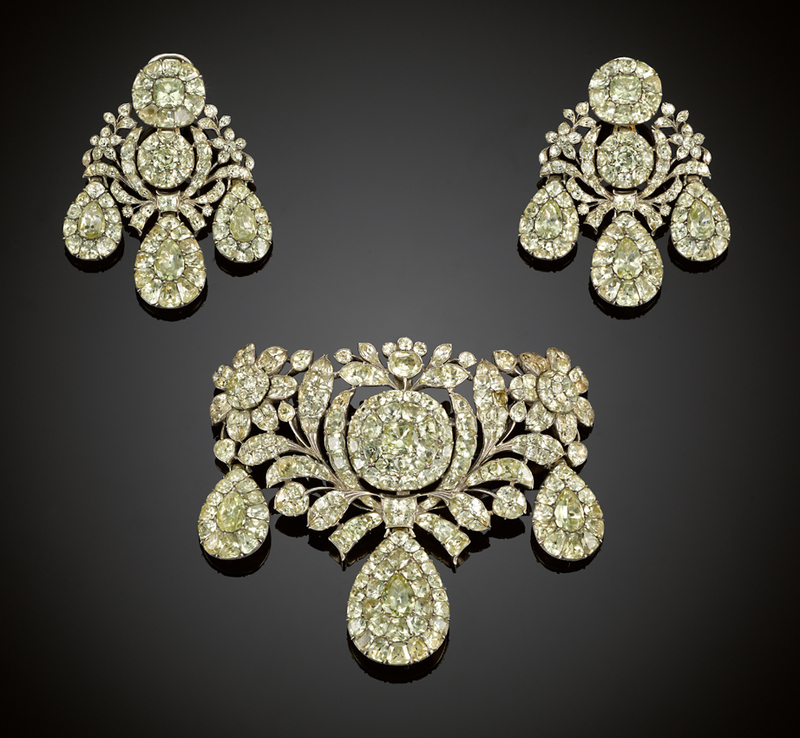 “We love jewellery from this period. It’s very showy and very beautiful – an unmistakable national style,” says Norton. Most of the 70 pieces have been acquired from sources away from the Iberian Peninsula, but this group is now deemed the rival of any collection within Portugal itself. It was on the advice of João Magalhães, Sotheby’s representative in Lisbon, who saw the collection in Mayfair last October, that the collection travels to the Portuguese capital this spring. From May 25-28, augmented by loans from private collectors, it will be on show at the Casa-Museu Medeiros e Almeida before returning to London where many elements will be offered for sale at SJ’s new Bruton Street shop. Accompanying the dual-branded Sotheby’s-SJ Phillips show is the very readable Jewels of Portugal penned by jewellery historian Diana Scarisbrick. More than just an exhibition catalogue, it documents the social, economic and artistic impulses that made the 18th century the apogee of Portuguese jewellery making. Despite the relatively high survival rate of this material – according to Scarisbrick, “handed down in families, or in the church, more jewellery from the period 1755-1825 remains to us from Portugal than any other country” – it is the first book on the subject published in English. 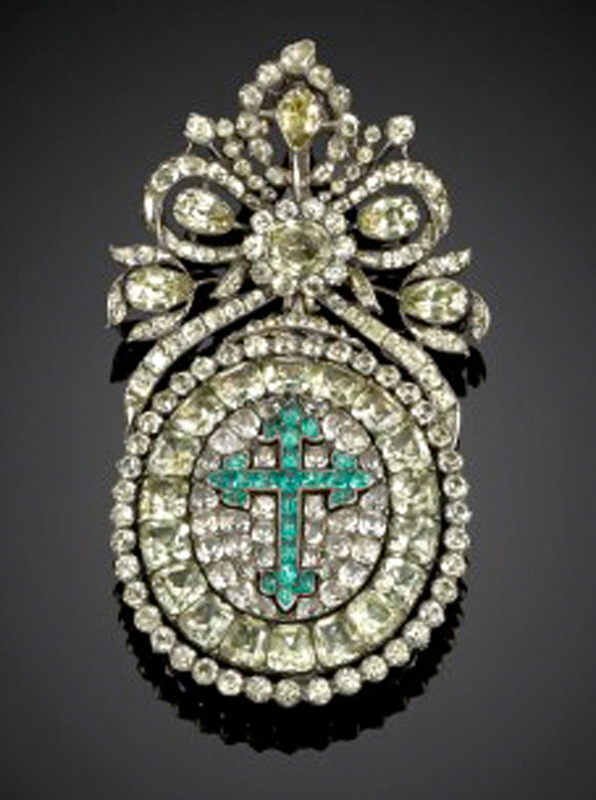 Portugal, like much of Europe, typically followed the French in courtly jewellery design. The classic forms, drawing on floral and sacred motifs, were the heavy three-drop girandole earrings, bow-knot pendants (the laças or the sequilé) and baroque brooches, ranging in scale from the wide stomacher filling the space between neckline and waist to a modest pin. Coupled with the workmanship of the Lisbon cutters and goldsmiths, it was the stones from the Minas-Novas that gave Portuguese jewels their regional flavour. As symbols of wealth and social status, these feature prominently in late 17th and 18th century portraits of the royal family and noble houses. But not everything was the preserve of the nobility. 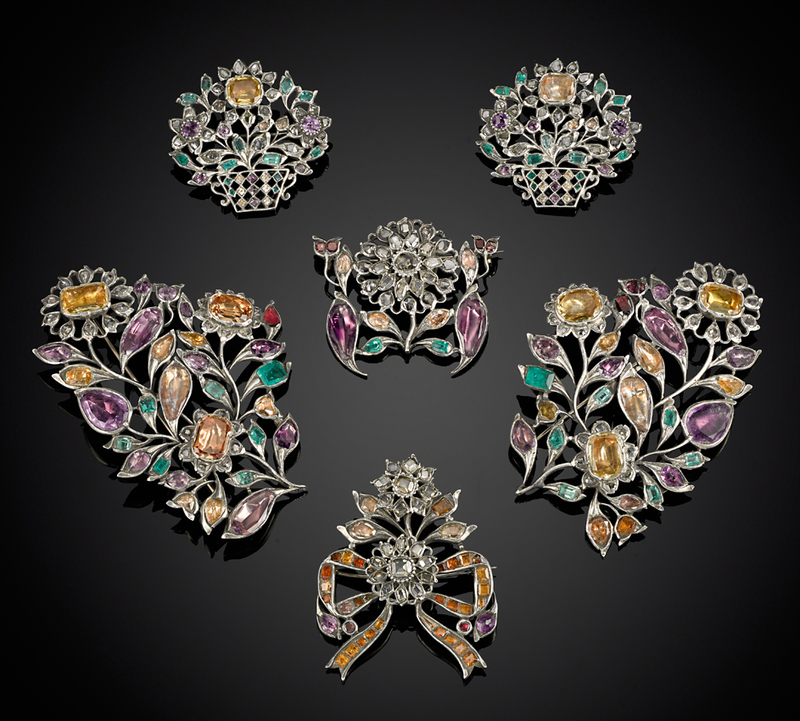 Besides the supplies of Brazilian diamonds, emeralds and rubies were semi-precious gems, set in silver with foil to add lustre in candlelight, that put jewellery within the reach of Portuguese women of more modest means. In particular, topazes of all hues from colourless to rose pink and amber yellow flooded into Portugal – third only to gold and diamonds as an important commercial gem deposit for the state. Something of this broad appeal can be seen at SJ Phillips where prices will range from £2000 to £200,000. 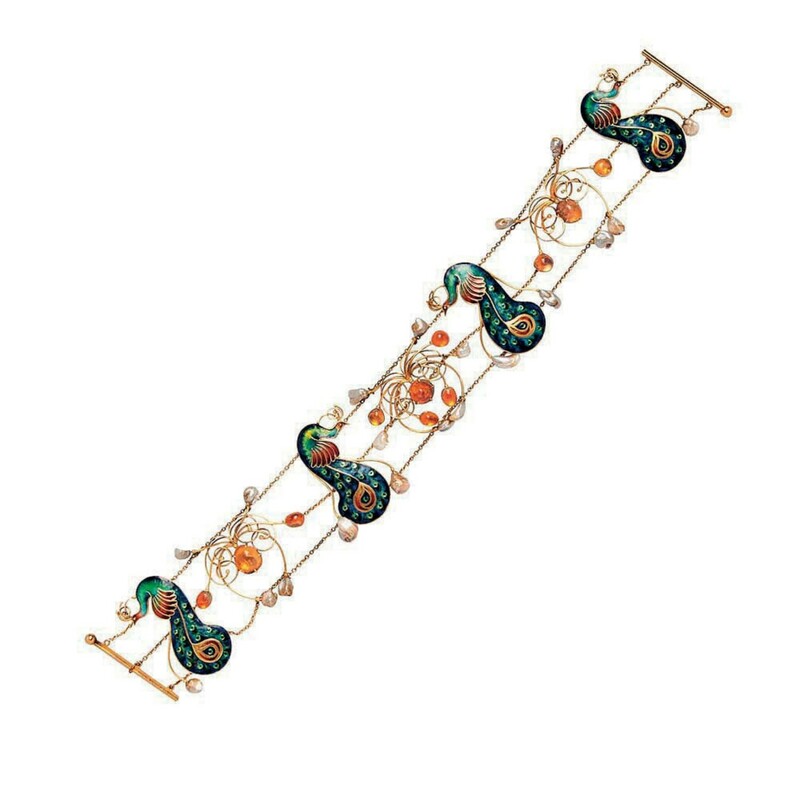 When exhibited at the Delaware Art Museum in 1976 as part of an exhibition, The Pre Raphaelite Era 1848-1914, an Arts & Crafts gold wirework, fire opal, seed pearl and enamel ‘peacock’ dog collar c.1905 was deemed “almost certainly designed by CR Ashbee”. However, when pictured in Twentieth Century British Jewellery from 1900 to 1980 by Peter Hinks (1983), the work was attributed to Alfred Edward Jones (1879-1954). Better known as a silversmith, Jones’ complex jewellery designs made for the Birmingham and Bromsgrove Guilds were, says Hinks, marked by “enlaced tendrils and scrolls, tapered and tipped with droplets of gold”. The Gaskins enamelled some of his silver pieces. This was one of several items from the property of collector Carol J Ferranti, who died last year, sold by Skinner (23% buyer’s premium) in Boston on March 21. It sold just below hopes at $8500 (£6855). 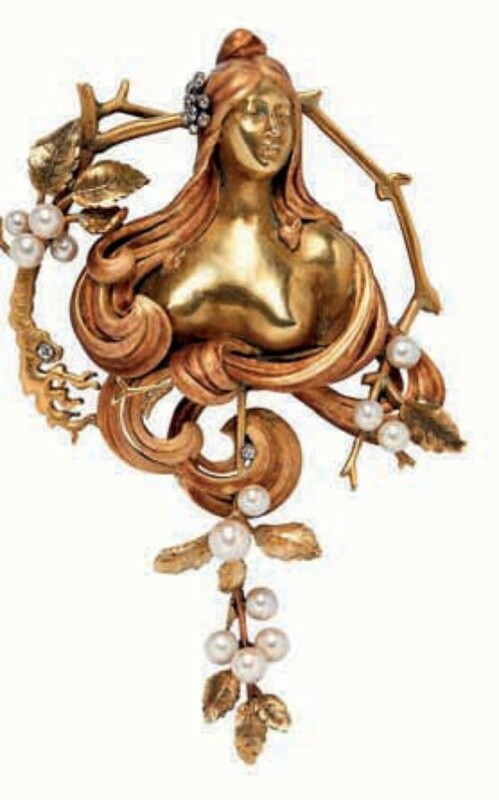 From the same source was an Art Nouveau gold, enamel, pearl and diamond pendant by Gabriel Falguieres modelled as a barebreasted female with her hair flowing among branches. This piece, titled Fecundite, is pictured in La joaillerie francaise en 1900 by Georges Meusnier, a publication describing jewellery exhibited at the Paris exhibition of 1900 and again featured in the 1971 exhibition catalogue From Slave to Siren: The Victorian Woman and her Jewelry, from Neoclassical to Art Nouveau penned by Dora Jane Janson, whose own collection of Art Nouveau jewels was sold by Rago in New Jersey in 2016. Estimated at up to $20,000, it got away at $13,000. The run on natural untreated amber that, since 2013, has transformed a decorative resin to the financial status of a precious stone, has flushed out a lot of material. However, there are still good beads to be found – and exceptional prices paid for them when they appear for sale. At Gorringe’s (21% buyer’s premium) of Lewes on March 21 huge sums were bid for large amber beads, all of the orange butterscotch colour that is most admired by the Chinese. Amber necklace – £16,000 at Gorringe’s. A single strand graduated amber bead necklace with a gross weight of 334gm and a string of 27 beads with a weight of 188gm sold to online bidders at £16,000 and £8000 respectively. These sums (close to £60 per gram) value these particular beads at approximately twice that of 24ct gold. In China, Buddhist tradition associates amber with good fortune and traditional medicine values its calming, analgesic properties. 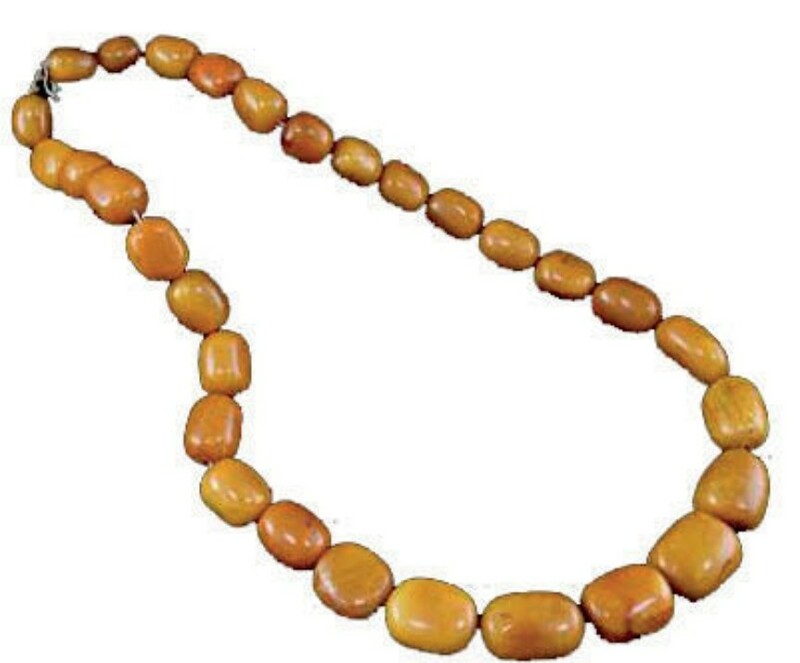 An even higher price per gram was bid at London Auctions (20% buyer’s premium) in Chiswick on March 27 for an exceptional natural amber bead necklace comprising 47 polished beads of varying size up to 36mm, on a single string. Weighing 235g, it hammered down at £14,400. A Victorian trefoil diamond brooch pendant sold by Lawrences (20% buyer’s premium) of Crewkerne on April 6 came in a fitted box inscribed to the front Presented to Lady Caird by Cammell Laird & Co. Ltd., Birkenhead on the occasion of the launch of HMS Dido, 18th July 1939. It doubled hopes at £2300. Dido was the name ship of her class of light cruisers for the Royal Navy. Constructed by Cammell Laird Shipyard of Birkenhead, she entered service in 1940 and took part in several battles in the Mediterranean and Arctic theatres of war. She was scrapped in 1957. Weeping willows, tombstones and memorial urns were common images on Georgian mourning jewellery. The marquise ring offered at Fellows’ (20% buyer’s premium) Vintage Jewellery & Accessories sale on March 13 featured a typical enamel scene painted in sepia but was heightened with gold wire and a baroque pearl forming the urn. Late Georgian mourning ring – £1800 at Fellows. With a border of paste stones and woven hair, it sold at £1800. A massive collection of mainly Victorian mourning jewellery was offered at London Auction Rooms (20% buyer’s premium) in Chiswick on March 27. More than 1000 pieces (only half of the collection) were offered across 70 lots. All came from the estate of an elderly lady in north London who, unbeknown to her family, had been collecting for many years. The running total so far is £26,800. A John Donald opal and diamond ring was one of the 15 lots by the designer that formed part of the £13.7m Princess Margaret sale held at Christie’s in June 2006. Then in the bid-happy atmosphere of a royal souvenir sale, it had been estimated at £700-900 but sold for £12,000. Such items rarely bring a return when re-offered for sale but, with Donald’s name now riding high alongside that of Swinging Sixties contemporary Andrew Grima, this 1976 ring came pretty close when sold at Chiswick Auctions (22% buyer’s premium) on February 21. With an estimate of £5000-7000, it took £11,000. Both Princess Margaret and the Queen Mother patronised Donald in the 1970s, having been introduced to him by the late Earl of Snowdon. Child & Child pendant – £3200 at George Kidner. Walter Child (1840-1930) and Harold Child (1848-1915), the sons of an East End pawnbroker who left a fortune of £30,000, opened as art jewellers in 1880 at 1 Seville Street, Belgravia. The firm’s distinctive stock of enamelled and gem-set jewellery attracted the patronage of Queen Victoria, Edward VII, the Tsarina of Russia and a number of artists. Sir Edward Burne-Jones is thought to have designed a number of pieces. A Child & Child gold, greenstained ivory and citrine flower brooch c.1890 attributed to Burne-Jones was given to the Victoria and Albert Museum by Geoffrey Munn through The Art Fund in 1999. John Donald opal and diamond ring – £11,000 at Chiswick Auctions. 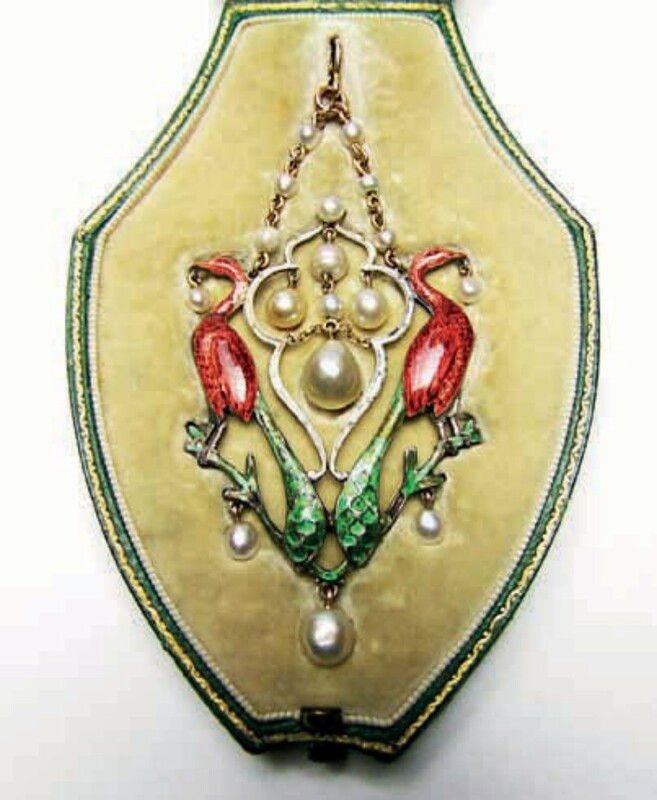 A gold, enamel and pearl peacock jewel sold by George Kidner (19% buyer’s premium) in Leamington on March 2, dates from the period 1891-1916, when Child & Child was located at 35 Alfred Place (now Thurloe Street) close to South Kensington tube station. The firm’s trade mark (C&C with a sunflower between) can still be seen moulded in plaster above a first-floor window. Each of the two adorsed peacocks on this jewel, with red guilloche enamel bodies and green tails, hangs a pearl in its beak with other pearls (the largest testing as natural saltwater) suspended from enamelled branches. Despite some losses to the enamel, it sold in its C&C leather case for £3200.